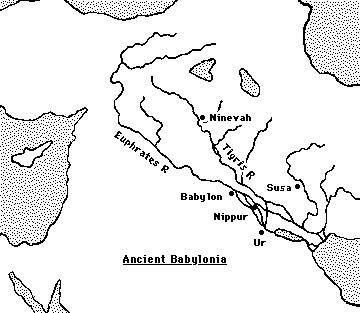 The Babylonians lived in Mesopotamia, a fertile plain between the Tigris and Euphrates rivers. Here is a map of the region where the civilisation flourished. The region had been the centre of the Sumerian civilisation which flourished before 3500 BC. This was an advanced civilisation building cities and supporting the people with irrigation systems, a legal system, administration, and even a postal service. Writing developed and counting was based on a sexagesimal system, that is to say base 60. Around 2300 BC the Akkadians invaded the area and for some time the more backward culture of the Akkadians mixed with the more advanced culture of the Sumerians. The Akkadians invented the abacus as a tool for counting and they developed somewhat clumsy methods of arithmetic with addition, subtraction, multiplication and division all playing a part. The Sumerians, however, revolted against Akkadian rule and by 2100 BC they were back in control. However the Babylonian civilisation, whose mathematics is the subject of this article, replaced that of the Sumerians from around 2000 BC The Babylonians were a Semitic people who invaded Mesopotamia defeating the Sumerians and by about 1900 BC establishing their capital at Babylon. The Sumerians had developed an abstract form of writing based on cuneiform (i.e. wedge-shaped) symbols. Their symbols were written on wet clay tablets which were baked in the hot sun and many thousands of these tablets have survived to this day. It was the use of a stylus on a clay medium that led to the use of cuneiform symbols since curved lines could not be drawn. 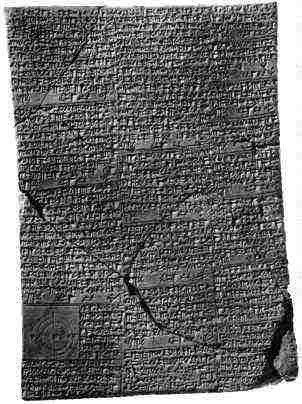 The later Babylonians adopted the same style of cuneiform writing on clay tablets. It was an important task for the rulers of Mesopotamia to dig canals and to maintain them, because canals were not only necessary for irrigation but also useful for the transport of goods and armies. The rulers or high government officials must have ordered Babylonian mathematicians to calculate the number of workers and days necessary for the building of a canal, and to calculate the total expenses of wages of the workers. The Babylonians had an advanced number system, in some ways more advanced than our present systems. It was a positional system with a base of 60 rather than the system with base 10 in widespread use today. For more details of the Babylonian numerals, and also a discussion as to the theories why they used base 60, see our article on Babylonian numerals. The Babylonians divided the day into 24 hours, each hour into 60 minutes, each minute into 60 seconds. This form of counting has survived for 4000 years. To write 5h 25' 30", i.e. 5 hours, 25 minutes, 30 seconds, is just to write the sexagesimal fraction, 5 25/60 30/3600. We adopt the notation 5; 25, 30 for this sexagesimal number, for more details regarding this notation see our article on Babylonian numerals. As a base 10 fraction the sexagesimal number 5; 25, 30 is 5 4/10 2/100 5/1000 which is written as 5.425 in decimal notation. and so on up to 592 = 58, 1 (= 58 × 60 +1 = 3481). which shows that a table of squares is all that is necessary to multiply numbers, simply taking the difference of the two squares that were looked up in the table then taking a quarter of the answer. Babylonian mathematics went far beyond arithmetical calculations. In our article on Pythagoras's theorem in Babylonian mathematics we examine some of their geometrical ideas and also some basic ideas in number theory. In this article we now examine some algebra which the Babylonians developed, particularly problems which led to equations and their solution. ax3 + bx2 = c.
(ax/b)3 + (ax/b)2 = ca2/b3. which could now be solved by looking up the n3 + n2 table for the value of n satisfying n3 + n2 = ca2/b3. When a solution was found for y then x was found by x = by/a. We stress again that all this was done without algebraic notation and showed a remarkable depth of understanding. Again a table would have been looked up to solve the linear equation ax = b. They would consult the 1/n table to find 1/a and then multiply the sexagesimal number given in the table by b. An example of a problem of this type is the following. Suppose, writes a scribe, 2/3 of 2/3 of a certain quantity of barley is taken, 100 units of barley are added and the original quantity recovered. The problem posed by the scribe is to find the quantity of barley. The solution given by the scribe is to compute 0; 40 times 0; 40 to get 0; 26, 40. Subtract this from 1; 00 to get 0; 33, 20. Look up the reciprocal of 0; 33, 20 in a table to get 1;48. Multiply 1;48 by 1,40 to get the answer 3,0.
which is, as the scribe knew, equivalent to solving (1 - 4/9)x = 100. This is why the scribe computed 2/3 × 2/3 subtracted the answer from 1 to get (1 - 4/9), then looked up 1/(1 - 4/9) and so x was found from 1/(1 - 4/9) multiplied by 100 giving 180 (which is 1; 48 times 1, 40 to get 3, 0 in sexagesimal). x = √[(b/2)2 + c] - (b/2) and x = √[(b/2)2 + c] + (b/2). Notice that in each case this is the positive root from the two roots of the quadratic and the one which will make sense in solving "real" problems. For example problems which led the Babylonians to equations of this type often concerned the area of a rectangle. For example if the area is given and the amount by which the length exceeds the breadth is given, then the breadth satisfies a quadratic equation and then they would apply the first version of the formula above. is, of course, not given by the scribe who finds the answer as follows. Compute half of 7, namely 3; 30, square it to get 12; 15. To this the scribe adds 1, 0 to get 1; 12, 15. Take its square root (from a table of squares) to get 8; 30. From this subtract 3; 30 to give the answer 5 for the breadth of the triangle. Notice that the scribe has effectively solved an equation of the type x2 + bx = c by using x = √[(b/2)2 + c] - (b/2). In  Berriman gives 13 typical examples of problems leading to quadratic equations taken from Old Babylonian tablets. If problems involving the area of rectangles lead to quadratic equations, then problems involving the volume of rectangular excavation (a "cellar") lead to cubic equations. The clay tablet BM 85200+ containing 36 problems of this type, is the earliest known attempt to set up and solve cubic equations. Hoyrup discusses this fascinating tablet in . Of course the Babylonians did not reach a general formula for solving cubics. This would not be found for well over three thousand years.